There are so many ways in which to tell your friends and family that you are expecting, but this is hands down my favorite! I had a wonderful photo shoot with a family that is expecting their second child and wanted to announce it to their family in an anti-cheesy way. They aren't fans of the heart shaped hands on the belly or the dad kissing/talking to the belly shots, which I can't blame them I'm not a fan either. So we came up with this simple, creative way to document the arrival of their newest family member. 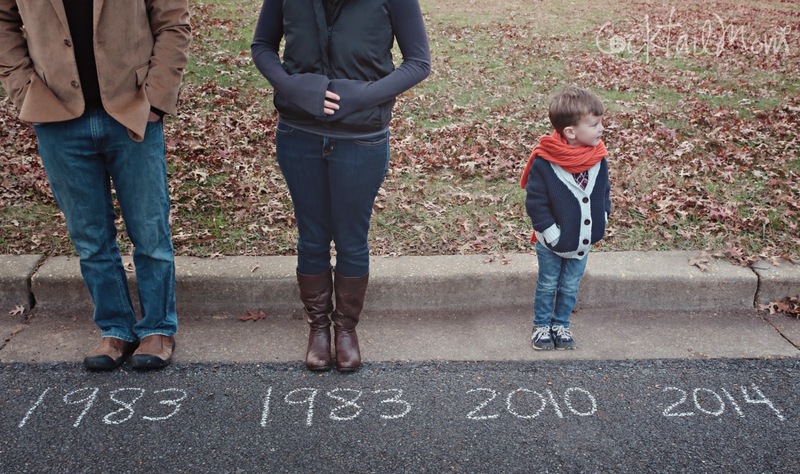 Using sidewalk chalk we wrote the year in which each member was born and the year that the baby was due to arrive. Hopefully we can recreate this shot with the baby sitting in his/her place next fall!